Fender MA-1 Review – A Great Guitar For Kids! We know you want to get your hands on Fender guitars. Who doesn’t? In case you did not know, Fender is a household name thanks to its mid-range and high-end guitars, which are some of the most impressive in the market. But you do not need to buy a $1,000 Fender guitar from its Paramount series if you want to experience it. The Fender MA-1 is a great option, especially for kids, offering a good mix of style and playability at an affordable price. Let’s dive a bit deeper and see why this guitar is such a good guitar for kids. The Fender MA-1 features a 3/4 scale parlor body that has a basic clean look. 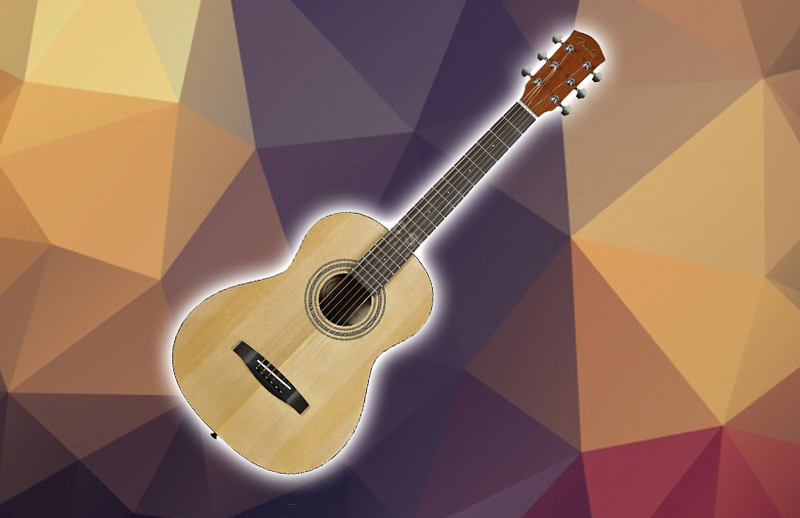 As an entry-level acoustic guitar in its price range, you cannot expect any solid woods here. But that should not put you off entirely. It might not be a custom shop model, the Fender MA-1 still delivers decent hardware. It features a classic X-bracing on the agathis top and a very pretty laminated Sapele rear and sides. Making the top, rear, and sides attractive is the satin finish. The neck with a rosewood fretboard is made from nato which is also coated in a satin finish. The construction and build are perfect for any child. The compact parlor body, the neck with a small 1.69-inch nut width, and a C-shaped profile make it more comfortable for kids or smaller players to use the guitar. The headstock sports a set of sealed die-cast chrome tuners. The guitar also has a solid rosewood bridge, a set of light gauge Fender Dura-Tone strings, a compensated saddle, and a synthetic bone nut. In this price point, you would not expect to get a gig bag to protect the guitar, but you will. Let us talk about tone and resonance, two of the most important things to look at. These are deal-breakers among pro players that beginners often just shrug off. The Fender MA-1, however, gives a decent sound to get all beginners started with their journey. The tone is balanced, clean, and crisp with a little mellow warmth thanks to the mahogany Sapele rear and sides. One big gripe about the Fender MA-1 is it lacks a little bit of presence. 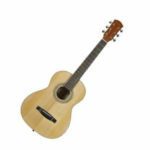 For a 3/4 scale parlor guitar in this price range, it is not too bad. The guitar still projects more than enough presence to be heard during practice and lessons. The Verdict: Should You Buy Fender MA-1? The Fender MA-1 is not the prettiest and most durable — that is for certain. You have two things from this guitar to take advantage of — the price tag and its playability. Other than that, everything else seems pretty standard. Buying it for an advanced and pro players would sound ridiculous as a matter of fact. But if you are giving to your child who is still learning the basics of playing an acoustic guitar, the Fender MA-1 is never a bad choice.